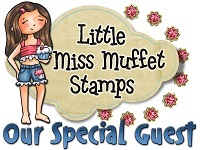 Today it's my pleasure to be a Guest Designer for the CAS Challenge at the Outlawz. The theme, in addition to being CAS, is to use at least one button. I have no idea who made the image for this since I forgot to properly label it when I saved it into my collection of miscellaneous images. I printed it twice in slightly different sizes, then colored both with ProMarkers. I used rectangle dies from Spellbinders and QuicKutz to cut them, then layered them with dimensional tape to make a kind of pyramid stack. I added tiny buttons to the corner and did the sentiment on mini Pop Dots. This one is CAS in design but with a more complex look. 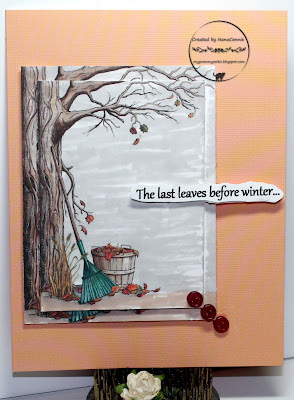 This card has to be my salute to the end of fall and with perfect timing. Our temperatures are expected to take a 25 degree drop between yesterday and tomorrow! Beautiful card, such a peaceful scene. Thanks for joining in the Crafty Calendar Challenge this month. Good luck! What a beautiful fall scene! I love how you layered the images!